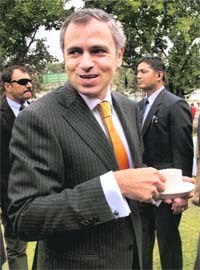 The last three years were both �the best of times� and �the worst of times�, said Jammu and Kashmir Chief Minister Omar Abdullah today, quoting from �A Tale of Two Cities� by Charles Dickens, after completing three years in office. 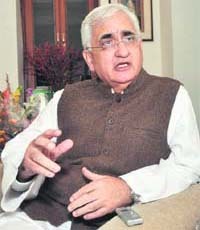 Union Law Minister Salman Khurshid has said that the Government had decided to reject the statutory complaint made by Army Chief VK Singh to correct his age because �there are rules by which we had to go by�. In an exclusive interview, Salman Khurshid, Union Minister for Law and Justice, spoke candidly to Raj Chengappa, Editor-in-Chief, The Tribune Group of Newspapers, on a range of key issues facing the UPA government. In what would come as a major boost to the government fighting hard to control inflation and facing criticism from Indian Inc, Tata Group Chairman Ratan Tata today said there was no need to be pessimistic about the Indian economy despite the global uncertainties. The Supreme Court today directed former Telecom Minister Sukh Ram to immediately surrender in the trial court before seeking bail, but he failed to comply with the order citing hospitalisation for treatment of a heart ailment. Despite sharp differences, the Congress went ahead to announce its candidates for the forthcoming Punjab Assembly elections just before midnight tonight. In a major fire that broke out at the offices of airlines situated at the cargo terminal of the Indira Gandhi International (IGI) Airport, documents pertaining to goods were reportedly destroyed. 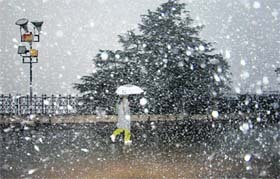 A government official harasses a person for bribe. He approaches the state vigilance bureau (SVB), which forms a team that stealthily accompanies the complainant when he goes to the official to pay the bribe. The complainant then hands over the bribe money - sprinkled with a chemical powder - to the official. 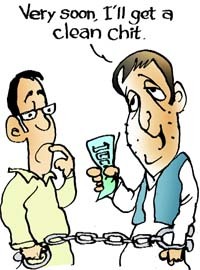 As soon as the accused accepts the notes, he is nabbed and made to wash hands.